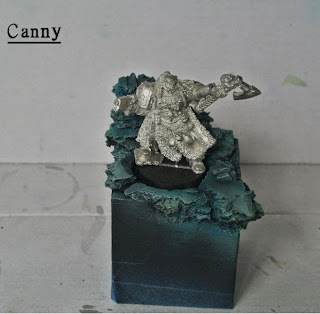 Thoughts on Basing miniatures, a simple base can be just as effective as a big base it all depends on how well it is executed. The colours I have used will aslo be used to paint parts of the miniature. Im going overboard with the colours on this base as its a little bigger and and I want it to reflect the harsh cold nature of Fenris and tie into the Power weapon and runes on the space wolf. So After looking around at some fancy basing and spending A LOT of time over at Massive Voodoo. I have decided to deviate from the standard rock drybrush. Starting by airbrushing some colour variation on to the rock base before I go for the highlights. The colours I used are Matt Black, German Grey, French Blue, Livery Green, and Wolf Grey. I didnt use pure Livery Green I mixed it with the blue and grey to get a teal colour. 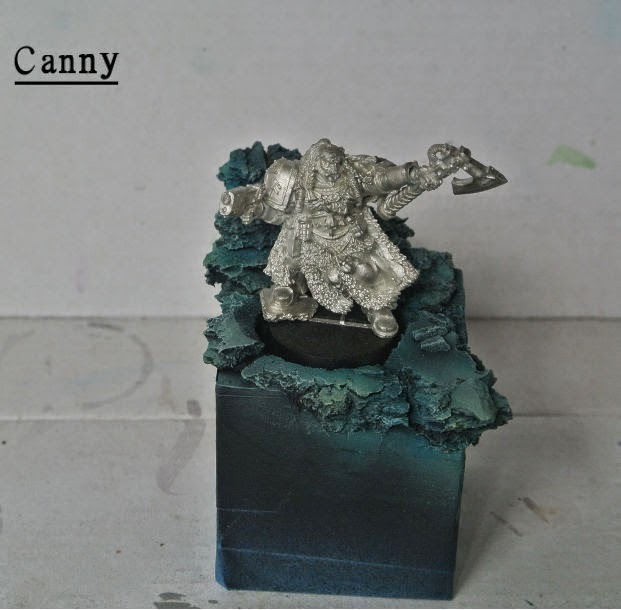 A shout out to Zab at Almost Perftec nice Idea to put the paints in a pic so you can match to the closest colour you have, and I can remember later what I used too! Next I used a mixture of the same colours for each area but lighter than the airbrushing, I started off with near black and brushed with a slightly wiped brush into the deepest cracks and areas where there would be shadow. After that I used wolf grey with a touch on green in places and wolf grey with a touch of french blue in places, then pure Wolf grey. I have not highlighted up to white as I'm not sure if I the white will get lost in the snow effects. I have decided that I'm going to go with woodland scenic soft flake snow and a mixture of realistic water for an icy feel and pva for softer powdery snow. Still waiting on my snow to arrive, post man must be busy. Thanks for the shout out. I mainly do it for my own memory too ;) Nothing like looking back at your own blog, scratching your head, going how the hell did I do that again?! I love those colors. I think the base looks just like how deeply cold and almost magical Fenris is in my head. Actually my front yard looks pretty close too. We got about a foot of snow on Saturday! Dare I dream? Will it finally be a white Christmas after 2 years of close calls? You can always leave the pure white highlights for the very end to see if it needs that extra pop! It also makes me wonder what white pigments would do on a base like that? Remind me to do some tests when I get started on my RT era Ragnar, okay? Sounds like a plan Zab, I have remember back in 1996 it was a White christmas in canada. I only remember as its the only christmas I have had in Canada. It was with my cousins who live in London Onterio. Whats RT? Rouge Trader. He's not quite that old but he's a classic metal Ragnar. Great look this base !